Looking for hotels near Meteora? Set in one of the highest points of Kastraki village with fantastic views of the Pindos Mountains, Pyrgos Adrachti offers spacious rooms with large windows at the base of the Meteora. Housed in an 1845 authentic stone building, recently restored as a traditional guest house, Petrino Guest house offers modern accommodations with breathtaking views of Meteora. Along with amazing views of the Meteora, Hotel Doupiani House features cozy and well-furnished rooms with free WiFi. The Monastery of Agios Nikolaos Anapafsas is just steps away. Built with stone and wood, in the village of Kastraki, Guest house Vavitsas offers elegantly decorated rooms with views of Meteora Rocks and their famous monasteries. Located in Kalabaka, within 1.6 miles of Meteora, Aspa's house offers accommodations with air conditioning. Guests can enjoy free WiFi. Hotel Kosta Famissi is located in Kalambaka’s entrance, only 0.6 mi from Meteora and the monasteries. It offers classic rooms, most with stunning views of the rocks. Our stay here was great. It was actually nicer than I was anticipating, plus we had a lovely view. Set amid lush greenery, the stone-built Stavraetos is located in the scenic Syrrako Village of Tzoumerka, at an altitude of 3773 feet. A very cozy and beautiful room with an excellent view! Located in the scenic mountain village of Metsovo, Katogi Averoff is a traditionally built property offering warmly decorated rooms with free Wi-Fi. The hotel was beautiful with classic features but all the rooms have been redone. Located in the scenic Prosilio Village, in Tzoumerka area, the stone-built Lakmos is surrounded by the lush greenery of Tzoumerka Mountains and features a bar with fireplace. large room, clean, great food! Perched on a green hill and surrounded by fir trees, Hotel Anax is located just 1640 feet from the center of Metsovo. Location is perfect, in quiet area, it's 5 min walk from center. Traditional stone-built structure with modern standards, Anavasi Mountain Resort is located among trees in Tsopela village. It features an indoor swimming pool and balconies with mountain views. The breakfast was very tradional with excellent quality. Built on a hill on the outskirts of Trikala, Ananti City Resort features a rooftop restaurant with panoramic view over the Thessalian plain, an outdoor pool and spa facilities. Beautiful view and great accommodations. Excellent staff and Great food. Highly recommend. Surrounded by Tzoumerka Mountains, in the Tsopela settlement, Hotel Xenion offers rooms with free Wi-Fi. It has a swimming pool with sun terrace and a traditional restaurant. Katrina, the manager is great, very helpful and nice. Located in the mountain town of Metsovo, famous for its architectural style, every room of traditional, stone-built Adonis hotel offers a fireplace, spa bath or jet shower panel and panoramic views. Perfect location. Idyllic place that brings joy to heart. Parking space free and big breakfast. Located just at the foot of the Meteora rocks, Theatro Hotel Odysseon offers stunning views of the famous setting and the Mount Pindos. Our room was tastely decorated and the bed was very comfortable. Koutsikouris Hotel is located in Oxia, 3.1 mi from Peukofito and 9.3 mi from Mouzaki village. Guests can enjoy the on-site restaurant and taste the traditional Greek dishes. Warm welcome. Wonderful view. Perfect location for a quiet night. The stone-built Archontiko Tsiboni is located in the center of Elati Villlage, just 33 feet from the main square. A very cozy traditional hotel just a few steps from the main square. 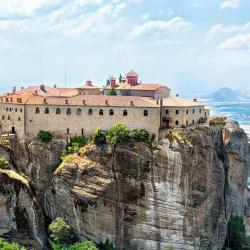 Hotels with great access to Meteora! Surrounded by lush greenery, Pandion Luxury Boutique Hotel & Suites with Spa offers traditional accommodations with panoramic views to Lake Plastiras and its surrounding area. Professional , friendly and service minded . Surrounded by a big garden, Hotel Oreades offers accommodations with views of Koziakas Mountain, within 656 feet of the center of Elati village. Just everything. A very big room. Everything was clean and new. 2 minuts by walking to the center. Traditionally stone-built, Hotel Ligeri is centrally located in Elati Village, just 49 feet from the main square. Certified with a Green Key, the luxurious, stone-built Aroma Dryos is centrally located in Metsovo, just 3 minutes away from the main square, offering a unique view to the mountains. Good bed, lovely bathroom and nice breakfast. Wonderful view of the mountains from the balcony. The Kassaros Hotel is just 164 feet from Metsovo’s center. It features free sauna, steam shower cabin and hot tub. Free Wi-Fi is available throughout the hotel. Nice and cosy hotel, located right in the center of metsovo, nice staff and helpful. The hiking trail starting from Kalambaka is much shorter than the one starting from Kastraki. If you are traveling in off season Kalambaka has more open in terms of restaurants and shops but the cities are within walking distance of each other. The natural views of Meteora are absolutely awesome from all angles. We have also visited all 6 monasteries in the area, and we like 3 of them - Monastery of St. Nicholas Anapavsa, Megalo Meteoro Monastery, Monastery of St. Stephen. If your schedule is tight, you can at least visit three in a half day. For afternoon visiting, it will go better if you know the closing hours. The closing hours varies from one monetary to another. Meteora was unbelievable! I recommend driving and exploring on your own then hopping on a tour with Meteora Thrones Tours. Our guide was fantastic and had ties to the community and was able to give us insight into some of the history. Get there early, as the monasteries close exactly at five. Get there early, as the monasteries close exactly at five. Wear good shoes, sandals are not good for climbing the steps. You need a skirt if you are a woman. Be prepared to park down the mountain road and climb a long distance up the road. Plan on spending two hours in the monastery if you like to see everything like we do. 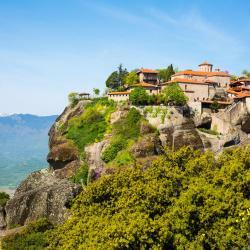 Kalabaka is located at the foot of the Meteora monasteries, that are built on top of a very strange natural phenomenon. Very impressive sight, both natural (the rock formations) and cultural (the monasteries on top). It is hundreds of years old monasteries that was built during the Byzantine era. The panoramic views in Meteora and breathtaking landscape is a must see. The history involved the activities you can do. Some of the monasteries have been abandoned and are now ruins. I recommend coming here in the winter like we did. The air is fresh and you can appreciate the Meteora more in the Winter. I can't imagine walking in heat in this area. Though you can take tents in the summer but it can get too crowded. So late Spring and early Autumn is the ideal time.